I did another 2 page journal spread in my House series for my sketches yesterday and today. My father built this house with the help of my mother's brothers and some friends - in a rural community approximately 20 miles from New York City. We moved in one week after I finished 3rd grade and I lived there until I graduated from high school - plus 4 college summers. As I was writing this I realized that I have lived in my NYC apartment longer than I lived in my childhood home - a surprising realization. I left out the trees on the front lawn because it wasn't possible to see the house. Maybe next winter I'll resketch this house from a winter photo and add the bare trees. Snow and trees are still challenges for me! 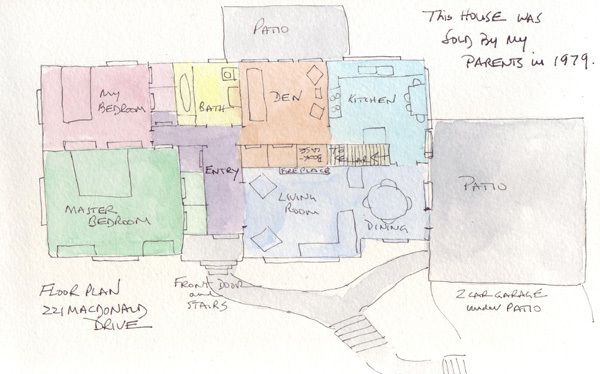 Next I plan to sketch the college dorm where I lived for 2 of my 4 years. 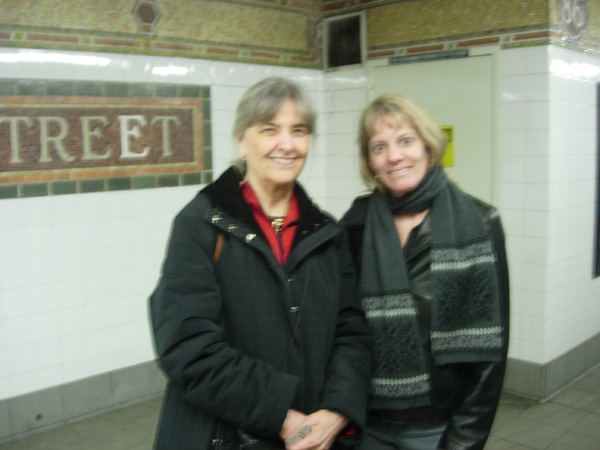 Martha, of Trumpetvine Travels, spent the day with my husband and me in New York. Christies and Sothebys, the big auction houses, are previewing the art for the Impressionism and Modern art auctions next week and there is fabulous art to be seen at both places. 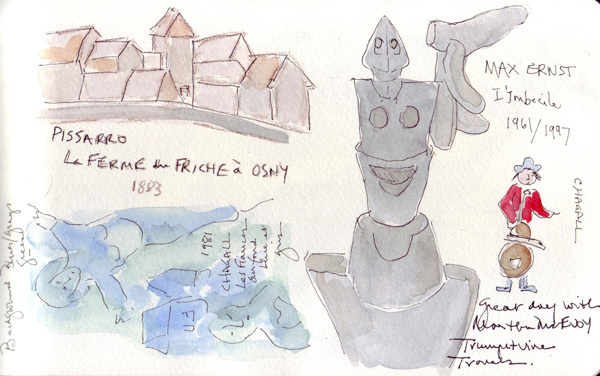 Martha and I wandered all of the galleries sketching small pieces of paintings and sculptures - just creating journal pages to reflect our experience. Over lunch we shared our most recent sketchbooks and then returned to my apartment for wine and a little watercolor painting. I'm constantly amazed how people from all over the US - and the world - are meeting to sketch because of the EDM community. These are the four journal pages that I filled while walking through all of the galleries - the first two at Christies and the second two at Sotheby's. 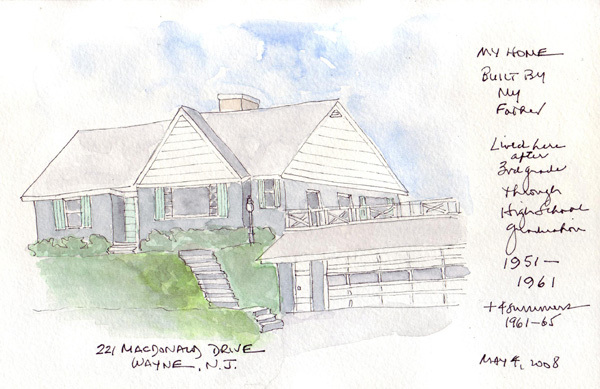 Martha said that she would post her sketches when she returns to California. 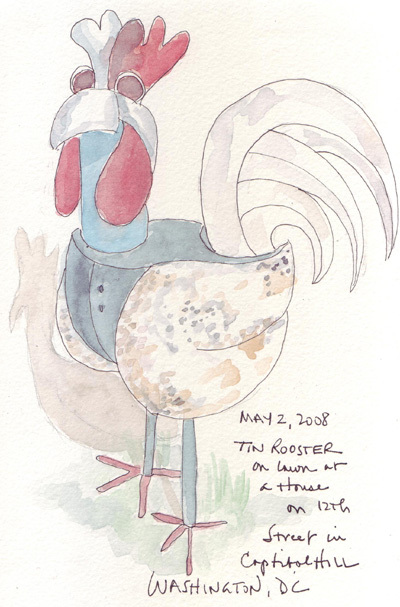 This large tin rooster is one of many sold at the Eastern Market Weekend Flea Market in Washington DC. The vendor says that they sell as soon as he gets another one from the artist in Mexico. I saw it early in the morning when walking through several weeks ago, but it was sold by the time I went back to sketch it. The following week my son emailed me a photo of the rooster proudly guarding a home on the lawn on 12th Street. They have so much character - rusted tin and all! 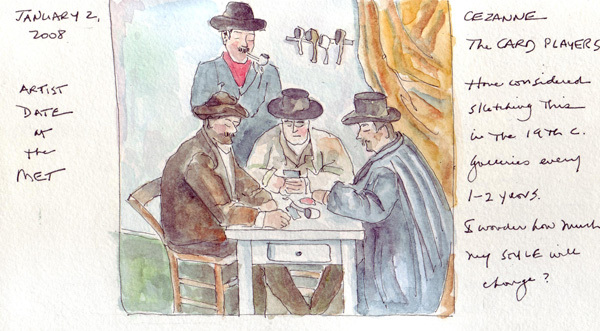 When linking to my previous "Museum Visits" posting I realized that I never uploaded my painted version of the Card Players. 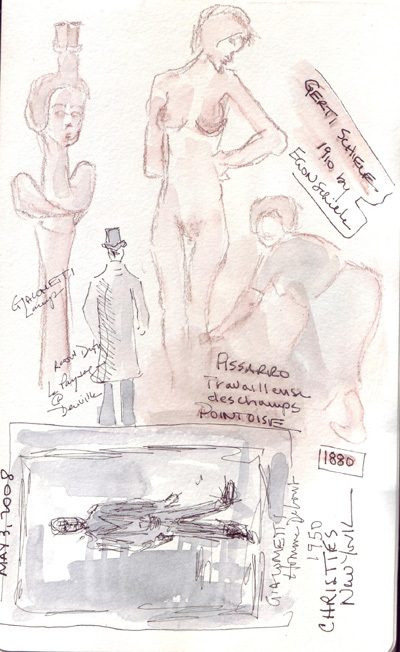 I will plan a return visit to the Met to sketch it again in January 2009 (paints not allowed). I debated whether to participate in this challenge again this year. I sketch everyday, but last year in May uploaded each sketch instead of just posting a sketchbook page several times each week. It definitely was more time consuming and I had to force myself to remain free in my choice of subject each day instead of worrying about "a published piece." 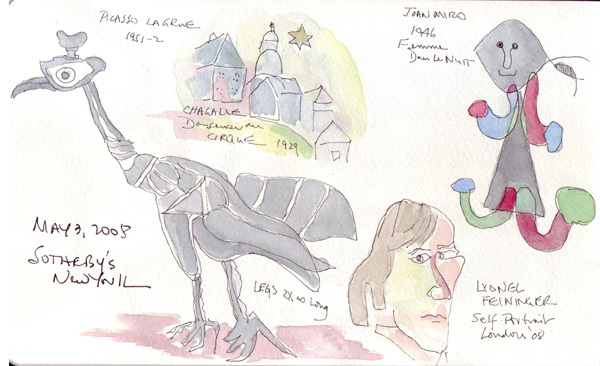 I finally decided that it might be good for me to again post each day's journal page - they certainly are reflective of a very eclectic art interest and maybe I can break through the "performance anxiety" a little more. 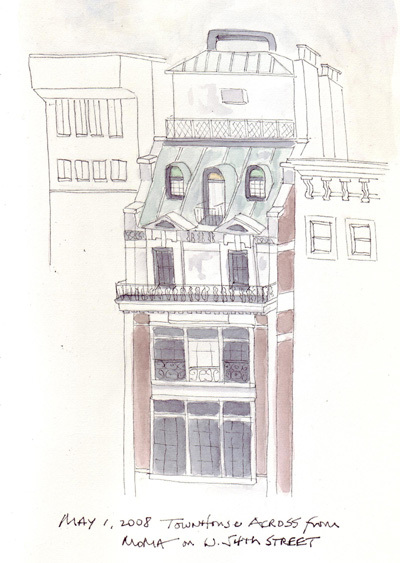 Yesterday I painted a sketch of a townhouse that I love. You can see it from one of the upper floor exhibit galleries on the north side of MoMA - and it is breathtakingly beautiful nestled among two rather plain and uninteresting buildings. 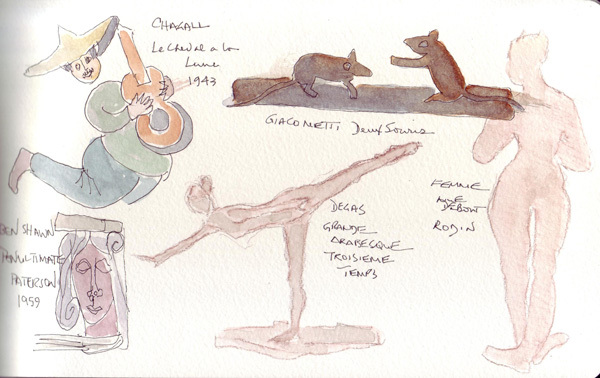 I sketched it from the MoMA gallery window earlier this year in my daily Moleskine watercolor sketchbook and posted it with sketches from several museum visits. But I wanted to have a sketch in my NYC "travel" sketchbook as well. The first sketch was done "live" and very quickly. The second was done from several photos that I have.